This 4W Golf Ball LED lamp is a direct replacement for a screw E27 32W incandescent lamp - giving an energy saving of up to 90%! 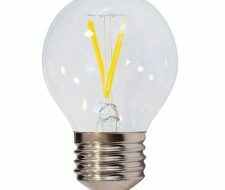 An attractive clear glass filament lamp. It produces an excellent light quality and good light output in 2800k. Have a look at our pdf with full technical specification or call our sales team to discuss your requirements.